After ten generations, some might think it is impossible to reinvent a household name. But Honda has gone and done it with the 2018 Accord. Now, if you didn’t think the Honda Accord could get any better, be prepared to be blown away, because Honda designed the new model from the ground up. Expert designers and engineers started with the basics and created a tenth-generation vehicle that is advanced, technologically driven and show-stopping. Jean Marc Leclerc, the Senior Vice President of Sales and Marketing of Honda Canada, said about the redesign, “we are redefining the Honda Accord for a new generation of buyers by bringing something unexpected that challenges the idea of what a mainstream sedan can be.” Honda decided to create a next-generation sedan that will make you stand out from the crowd and redefine what you think about sedans. The 2018 Accord will be produced at Honda’s Marysville, Ohio production plant. The Accord was actually the first vehicle from a Japanese automotive manufacturer to be produced on American soil, and has been produced there since 1982. 35 years later the production plant is growing and evolving, making it the perfect place to reinvent this amazing sedan. We expect the 2018 Honda Accord to be released this coming fall. To stay up to date on the latest information and release date, fill out our convenient form below. We will let you know everything the moment new information comes in, including when the new 2018 Honda Accord will be available to test-drive in Huntsville at Huntsville Honda. The 2018 Honda Accord will be available in three distinct powertrains, each with various trim levels. 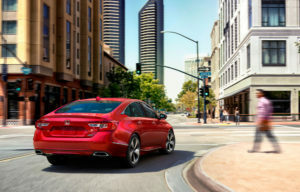 You will have no shortage of available options on this sedan; two turbocharged engines and one hybrid variation, create Accord’s for everyone. The all-new 1.5L 16-valve direct-injection turbocharged engine has maximum outputs of 192 horsepower and 192 ft-lb of torque. For those seeking pure power, opt for the 2.0L DOHC direct-injection turbocharged engine with i-VTEC, which gives you an amazing 252 horsepower. This 2.0L engine can be paired with a brand-new 10-speed transmission for even more precise handling. Besides the turbocharged engines, the 2018 Accord is also for though looking for fuel efficiency because it features a hybrid version. The Accord Hybrid will have a 2.0L Atkinson cycle engine paired with two electric motors. Since engineers and designers recreated the Accord from scratch, they could change everything for the better. The body structure is lighter and stronger than ever before. It features Honda’s ACE™ body structure and 29% ultra-high-strength steel. Taking cues from Honda’s classic design principles, the new Accord is wider and lower. The cabin features better visibility and more comfortable seating arrangements. A bold new front features Honda’s chrome wing front grille, LED headlights and a hood that makes this sedan standout. Aggressive styling throughout the 2018 Accord make it look sporty and clean. 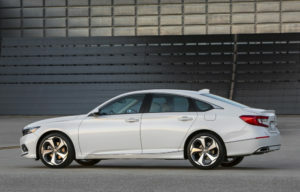 The styling also increases aerodynamics on the Accord by upwards of three percent, reducing drag. 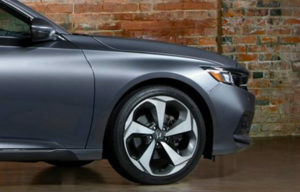 Technology was also at the core of the 2018 Accord’s redesign. The cabin features a 7-inch TFT driver meter and an 8-inch Display Audio touchscreen. Smartphone capability, customizable apps, HondaLink subscription services, remote unlocking, remote engine start, and remote diagnostics are just a few of the technology features available in the 2018 Accord. If you’re looking for more tech, getting the Touring trim on the turbocharged engine models gives you a 6-inch driver’s Head Up Display. This shows you everything from speed to rpm to traffic sign recognition. And just to keep you completely connected, the 2018 Honda Accord has available 4G LTE WiFi as well. In terms of comfort, the driver’s seat is available 12-way adjustable, and the front seats are available heated and ventilated in higher trim levels. Everyone is looking for a vehicle that will keep them safe and get a 5-star safety rating. 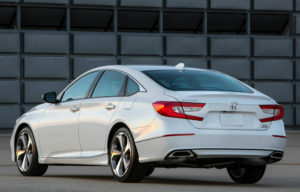 That is why Honda has decided that every 2018 Accord will get its range of Honda Sensing technologies standard. This means you will get a Multi-Angle Rearview Camera, Lane Departure Warning, Road Departure Mitigation, Collision Mitigation Braking System™ (CMBS™), Adaptive Cruise Control and new Traffic Sign Recognition with all Accords, whether you get the LX, Sport, Hybrid or Touring trim. That is a lot of safety, so you can rest easy knowing you and your passengers are safe. Extra options such as parking sensors, Cross Traffic Monitoring, and Driver Awareness Monitor are available. If you’re looking for parts or accessories for your Honda Accord, then come into Huntsville Honda in Huntsville, ON. We carry a variety of genuine Honda OEM replacement parts and all the accessories you could want. We look forward to helping you with all your parts and accessories needs in Huntsville. Our service department is also equipped for all installations.